The iOS keyboard is extremely functional. Not so much in the iPhone as in the iPad, since in the tablets of the company of the apple it is possible to add tildes, signs, symbols and numbers with a simple tactile gesture on the keys . But there are many other keyboard tricks that work for the iPhone. Writing on the iPhone's small keyboard is not always easy, even on the gigantic screen of the iPhone XS Max . At the time of clicking on the appropriate letter ... and when placing the text cursor on the appropriate place. It can become an overwhelming task. Positioning the cursor manually with a single touch in its proper place is practically impossible , and doing so keeping your finger pressed to access the cursor's magnifying glass also has its thing. No matter how small your hands, trying to place the tiny cursor between those two letters to correct an error is sometimes a challenge . And sometimes it takes several attempts to do so. What the hell, I even managed to erase entire words as long as I did not use the cursor! But it turns out that, fortunately, there is a method to solve this problem . 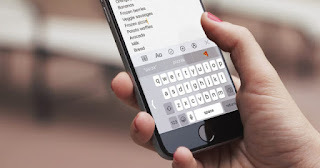 We can manually adjust the text cursor with our thick fingers, or we can simply use this function to convert the iOS keyboard into a trackpad . Twitter user @krissys_kitchen shared a tweet with this iOS trick and it went viral. It is noteworthy to note that this feature is available since the iPhone 6s was launched in 2015 . But not everyone knew her, something that is clearly reflected in the more than 120,000 likes of the tweet. To use this function and turn the keyboard into a trackpad for the text cursor, you just have to keep your finger pressed on the space bar and move it to one side. It works even to jump on the line. The function is available in both iPhone with 3D Touch and iPhone without 3D Touch. On the iPad it also works, keeping your finger pressed on the space bar and keeping two fingers pressed on any area of ​​the keyboard.